Kansas lawmakers just passed a revised budget that covers the remainder of this fiscal year, but they showed little confidence that their budget would actually work. To hedge, they added provisions allowing the governor to “delay” the final retirement system (KPERS) payment, or simply cut appropriations at the last minute in order for Kansas to escape financially from FY 2016. The KPERS provision allows the governor to make only 3 quarterly payments into the retirement system this fiscal year, if money runs out. The fourth payment must still be made, but not until next year, and then with 8 percent interest tacked on. That means 3 payments in FY 2016, but 5 in FY 2017. In other words, the KPERS payment gets put on the credit card. The state slides by now, but pays big time next year. Alternatively, or in addition, the governor can unilaterally make cuts to almost any part of the budget before the end of the fiscal year. Not enough money to pay expenses? Just don’t pay. These provisions have a “trigger mechanism” that has already triggered. The governor receives the authority to delay the KPERS payment or cut spending when the general fund balance falls below $100 million, a mark hit long ago. Lawmakers gave the governor this authority knowing the unlikelihood of the state having enough money to meet budgeted expenses. These extraordinary provisions allow lawmakers to dump the situation back on the governor and leave town without addressing the real problem—a large structural budget imbalance caused by unaffordable income tax cuts. Consider expenses. 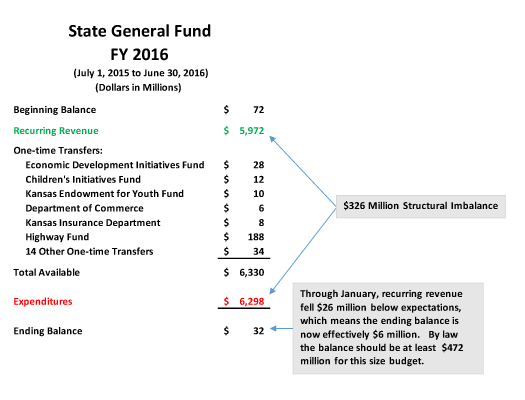 The revised budget sets general fund expenses at $6.298 billion. That budget already imposes many spending cuts, leaves school funding with inequities, accepts operational problems up and down state government, and shifts $106 million of school transportation costs to the highway fund for payment. But Kansas will not receive enough revenue to meet that conservative set of expenses. 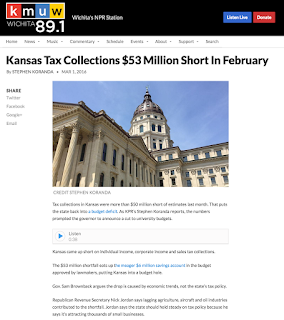 Even though sales tax rates were raised to record levels, the official revenue estimate only forecasts $5.972 billion in recurring revenue, but Kansas is not currently on pace to garner that. To get the rest of the way, lawmakers have agreed to transfer more than $300 million from other funds. And when that’s not enough, the governor can delay the last KPERS payment, or cut programs some more. Uncertainty prevails. Agencies and schools do not have assurance that they can count on their appropriations. Kansas lives day-to-day on the financial margin. The fallout from the income tax cuts is exacting a high toll on Kansas finances, a crippling problem that will continue until lawmakers face the mistake that has been made.